I started a new job last week and one of the many good things about it is that I get to work from home and therefore save myself an extra two hours a day that I used to spend at the mercy of London Underground. I can also work flexible hours so, in theory, I could start work early and then finish early, giving myself lots of time in the evening to spend in the kitchen. I haven’t quite got myself into a routine yet though so what generally happens is, I finish work and then realise there’s very little food in the house and I have no idea what to cook. I meant to resolve this at the weekend by planning lots of meals that I could start in the morning before work or be ready to prepare when my working day is finished. I didn’t get round to it though, I did however manage to buy vodka which meant we could eat this (original recipe here), never let it be said that I don’t have my priorities in order. In a happy coincidence, a rather nice man knocked on my door yesterday and presented me with 40 rashers of bacon (more on that later) so I did the only thing I could in that situation, immediately fried some up and added it to the pasta sauce. Of course, everything is better with bacon but this took quite a lot of seasoning and lemon juice before it was properly balanced (Sainsbury’s have stopped selling my favourite San Marzano tomatoes so I tried some tinned cherry tomatoes which weren’t brilliant: too sweet and too much skin) but, once it was balanced, it was a good combination. Of course, now I not only have to work out what we’re going to eat next week but I also have to work out how to incorporate those 40 rashers of bacon before they expire. 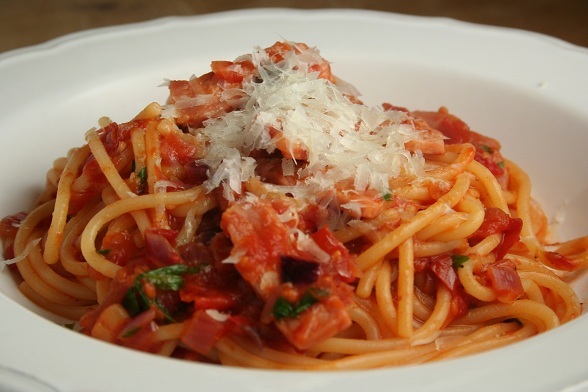 Subscribe to comments with RSS	or TrackBack to 'Spaghetti alla Vodka (with bacon)'. The Curious Cat´s last blog post ..Temporary Message to Maratanga! I wish someone turned up at my door with 30 rashers of bacon!